1. 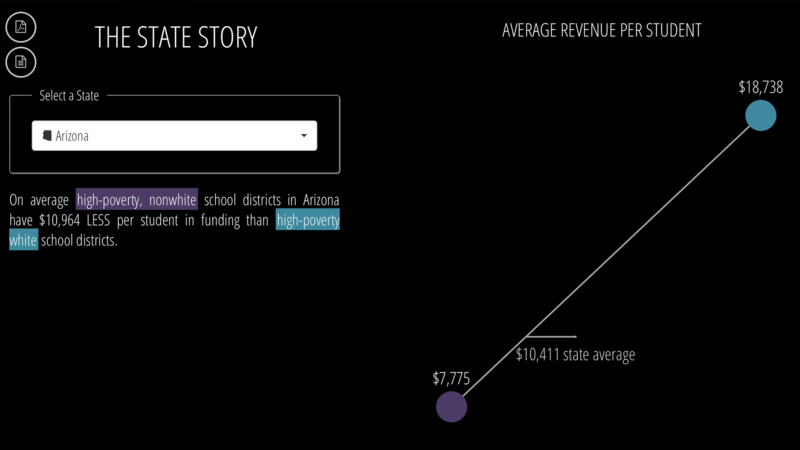 Even with recent increases to teacher pay, Arizona’s teacher salaries remain over $11,000 below the national average. 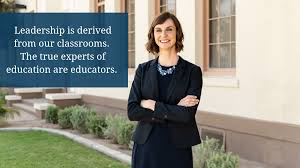 According to Lindsey Perry, the AZ Auditor General, part of the lower salary may be due to an AZ average teacher experience of 11 years compared to 13.7 for nation. 2. After adjusting for inflation, total per pupil spending is $177 less now than in 2004 and $861 below that of 2008. 3. 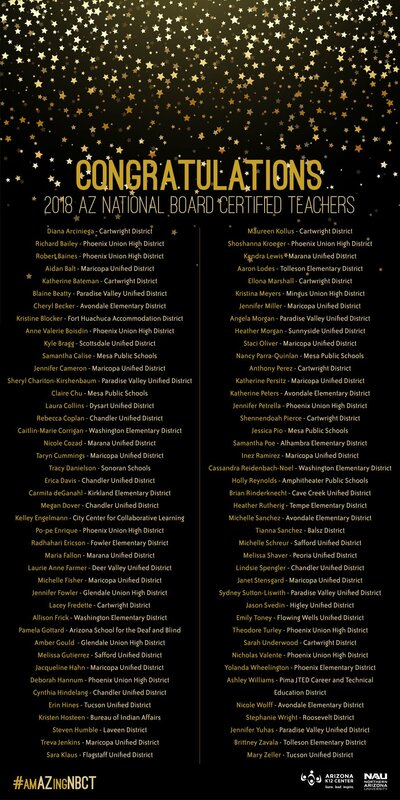 Arizona spends $8,300 per student with 54% of that being in the classroom, compared with a national average of $11,800 and 60.9% in the classroom. 4. The lower amount Arizona spends in the classroom isn’t due to high administration costs which are only 10.4% of total dollars versus a national average of 11.2%. Rather it can be attributed in part, to higher energy costs due to extreme temperatures, more money spent on food services, higher transportation costs to serve rural and remote areas and higher class sizes. 6. Student support cost is high due to the large percentage of students living in poverty or those with special needs. 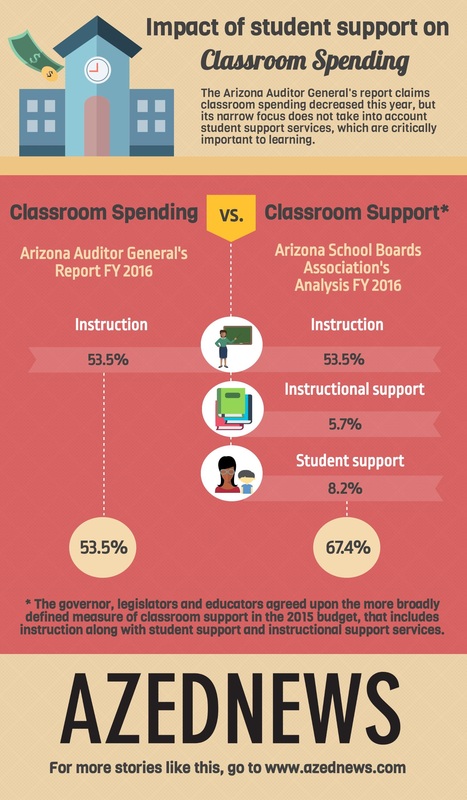 Also important to note when discussing classroom support expenditures, is that Arizona lawmakers and educators disagree with the AZ Auditor General’s exclusion of instruction and student support when calculating classroom support dollars. In 2015 in fact, the governor, legislators and educators agreed to a change in state law that required, (beginning with the FY 2016 budget) to include reading and math intervention specialists, media specialists, librarians, counselors, social workers, nurses, psychologists and seed, occupational and physical therapists in the classroom support line item. They understood that these specialists directly contribute to improved academic outcomes for students and should be included in the classroom support totals. Yes, at least charter schools do get audited (not by the state, but an auditor of their choice), but it is a compliance audit, not one to determine efficiency of operations. 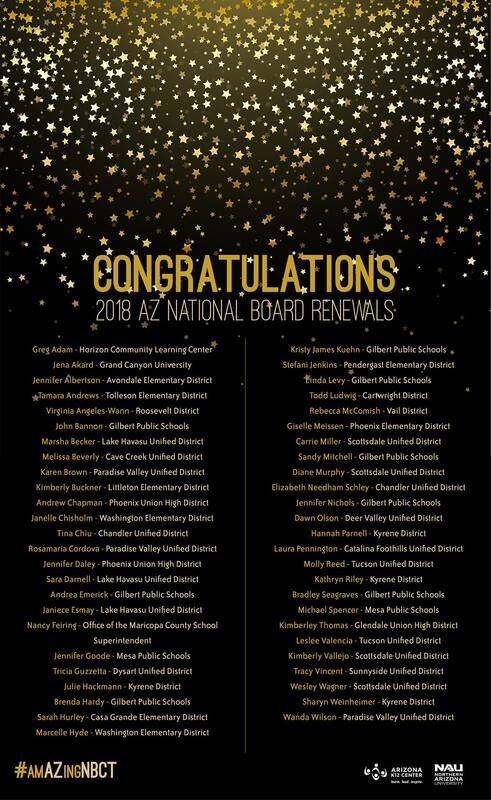 And, it is the State Board for Charter Schools rather than the AZ Auditor General who is responsible for audit and compliance oversight, so the results of audits are not reported by the latter which makes it difficult to compare them with those of district schools. We do know however, that administration costs in charter schools have typically been double that of district schools. So much for charter schools being models of efficiency. What we are in total darkness about, is the efficiency of private and parochial school tax dollar spending (via corporate and individual tax credits and vouchers) which in 2017 was about $200M and grows exponentially every year. Funny how those who rail about inefficiencies at public district schools, seem to never be as concerned about tax dollars spent by alternative options. Fortunately, this tide has been turning lately, given all the charter school scandals in the news. As for what’s going on in private schools, that’s anyone’s guess. Here’s the bottom line. WHEREVER public tax dollars are spent, the public has a right to know the efficiency and effectiveness of that spending. If educational entities accept our money, they should be forced to accept our oversight. It is that simple. Moreover, when we consider poor nonwhite districts to poor white districts, the disparity gets even worse. In Arizona, 34% of students attend racially isolated school districts, with 32% attending high-poverty, predominantly nonwhite school districts, and 1% attending high-poverty predominantly white school districts. 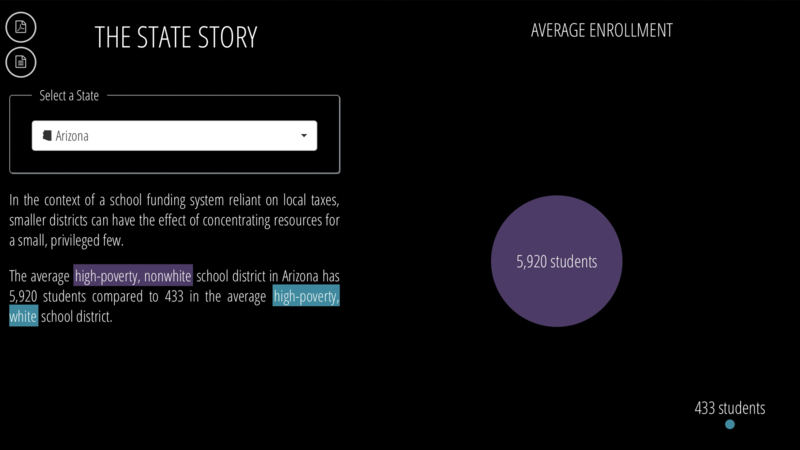 “The average high-poverty, nonwhite school district in Arizona has 5,920 students compared to 433 in the average high-poverty, white school district. The difference in funding between them is 59%, or $11,000 less per student. Where the average revenue (funding) per student is $10,400, that can be hard to wrap your head around. But, Chuck Essigs of the Arizona Association of School Business Officials, and Matthew Ladner, Senior Research Strategist at the Arizona Chamber Foundation, agreed that EdBuild should have added up expenditures for all white and non-white school district groups, and divided that number by the number of students in each group. If they had said Ladner, the disparity would have been about $772 per student, rather than the astronomical $7,613 that EdBuild reported. On the high poverty, racially concentrated schools, the actual disparity would have been about $1,400 rather than the nearly $11,000 EdBuild reported. 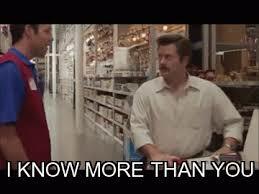 I know Anabel and if she says there’s more to the story, there is. But, we must be open to the truth that our current school funding formula, which has been in place for 35 years — before charters, school tax credits, and vouchers were part of the landscape — needs to be relooked. “”So long as we link opportunity to gerrymandered borders and school funding to local wealth, we will never have a fair education system,“ Sibilia says. ”The wrenching reality is that“, says Rebecca Sibilia, CEO of EdBuild, ”from any angle, America is investing billions more in the future of white children.” And that should not be, of course, acceptable to anyone.